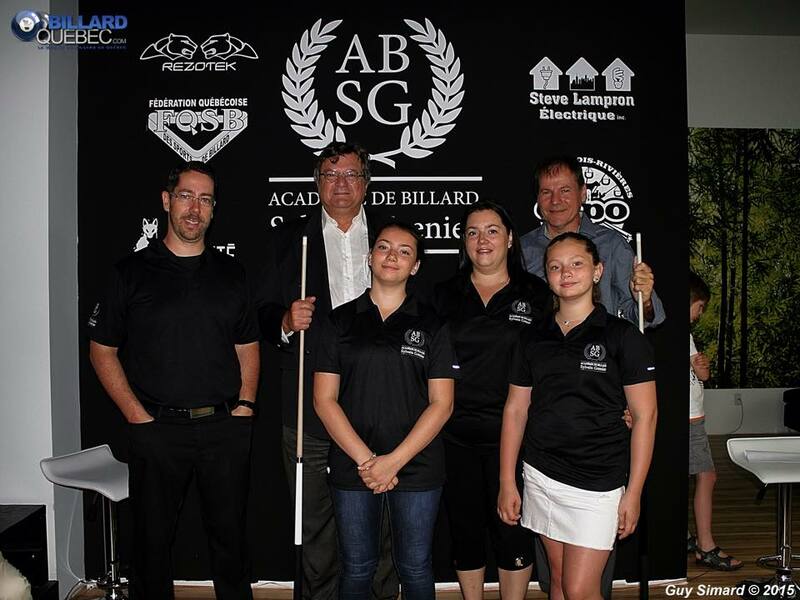 This past Monday July 20th the "Académie de Billard Sylvain Grenier" celebrated its grand opening.The Academy is the brain child of Sylvain Grenier one of Québec's top professional pool players. Grenier who turned Pro in 1999 left the game completely in 2003 to focus on family. It was just within the last few years that he got the itch to get back into the pool scene during some home renovations in which he decided to reinstall his table. Coming off such a long layoff did not seem to affect him as much as he quickly re-established himself as not only one of the top talents in Québec but in Canada as well. Once competing again and traveling to the U.S to participate on the Joss Tour he began reflecting on the current state of pool. One of the first things he noticed is the laws are very different for pool halls south of the border. With no Video Lottery machines in the pool halls he noticed children were welcomed in these places. In Québec there are very firm laws that no one under 18 years old is allowed in the pool halls because of drinking and gambling age requirements. Having a young teenage daughter with a great interest in learning the game, he identified this as something that was preventing the evolution of the sport. According to the press release from the Academie, they identified that many youth centres and schools had tables set up. But had no one around with the proper credentials to teach the children how to play the right way. The philosophy here is that Grenier believes many people are familiar with the recreational side of pool, but when it comes to treating it as a sport there is a lot of room to grow. Another one of Grenier's goals is to show that pool is comparable to other sports like Hockey, Soccer, Dance and Karate. Comparable in the sense that pool is great for mental development, social skills and so on. After identifying his goals Grenier took to social media to see what the response would be to him opening up an academy geared to the development of players all ages and skill levels. To his delight the idea was met with great enthusiasm by players and parents alike. While researching the best way to go about this Grenier quickly realized there was no previous examples in Canada to base his model from. 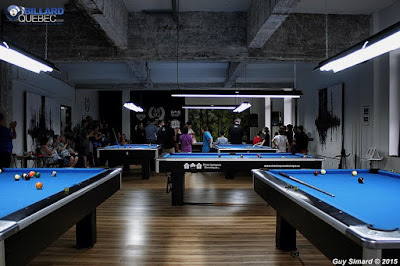 For he wanted to open a place that is solely focused on pool and the precision it takes to play at a high level, and he wanted this without the distractions of Alcohol and Video Lottery machines. This led to the development of the current system that Grenier has. The Academy is not a pool hall in a traditional sense. It is a place of learning, which sells memberships where players can get lessons geared directly for their skill level by Grenier. Another interesting part of this model is members have 24 hour access to the facility with the use of a "Smart Key." For safety there is a surveillance camera active which will identify when the facility is in use. During the grand opening many players and enthusiasts came to show support. Danny Hewitt who is perhaps arguably Québec's number 1 player at this time also drove down to Trois-Rivere to show his support. I would like to congratulate Sylvain Grenier and Josiane Larocque for opening what I hope is the first of many academies that will spring up across Canada, and also thank them for the information necessary to write this article. In Europe and Asia there are many government backed academies similar to this one and it is easily the reason why they currently dominate the sport. 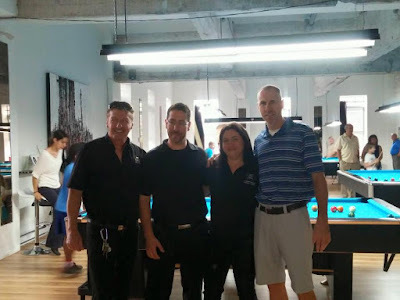 I believe academies are the way of the future not only for properly developing players but to extinguish the old stigma of pool halls and the negativity that goes a long with it. Cue Sport Nation looks forward to seeing how this project develops and we are very eager to help where we can. Ramos Finds His Gear !! Results From the Canadian Amateur Championships.